Zaxxon was a surprise success in a time when space shooters were on the wane in arcades, and "cute" games were the real quarter earners. Sega released Zaxxon in 1982, and it was an immediate head turner. By employing an isometric display for the graphics, Zaxxon presented players with an unprecedented approximation in 3D graphics. Not only could players fly left and right across the landscape, they could also increase or decrease their altitude, all the while flying forward. The joystick resembled an aircraft control stick with a trigger fire button. In Zaxxon, players had to pilot a ship through what amounted to an obstacle course. Walls and energy fences had to be flown over, or through, at just the right altitude, in order to survive. Enemies served more as bonus point targets than real threats, although missiles and cannon fire had to be avoided. Each stage contained two pockets of landscapes separated by a section of open space, where enemy ships attacked vigorously. Ultimately, the player went head to head with the titular character itself. 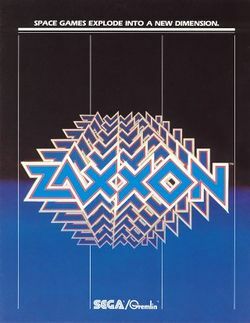 Because of Zaxxon's novel presentation, and great popularity in the arcades, it was seen as a obvious choice for conversion to the home console and computer market. While Coleco snapped up the rights to publish the game on many popular home consoles, Sega actually took it upon themselves to develop Zaxxon for a few platforms through their new home development department. Datasoft and Synapse targeted any remaining platforms that the first two companies did not develop for. You control an attack ship that must be piloted over two asteroid city landscapes. Your ship can move left and right, as well as climb and dive. An altimeter displays your current height above the ground. You can fire a laser to destroy ground targets and aerial opponents. You must be at the same height as your target to destroy it. You will lose one ship if you collide with any object, or are hit by enemy fire. Between the first and second city landscape, you will fly through empty space while being attacked by a squad of enemy spacecraft. At the end of the second landscape, you will face Zaxxon, a large robot, in a duel to the death. 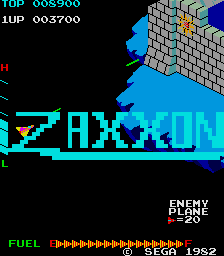 You must hit Zaxxon's missile six times to defeat it, or you will be destroyed. This page was last edited on 8 July 2014, at 00:51. This page has been accessed 17,480 times.